Motorcycle manufacturers around the world have now started working on the next generation of safety features. Ducati has already stated officially that it will offer a host of safety features on its motorcycles, that is a part of the company's 2025 Safety Road Map. KTM, as well, is working on developing radar-based safety tech for its machines. 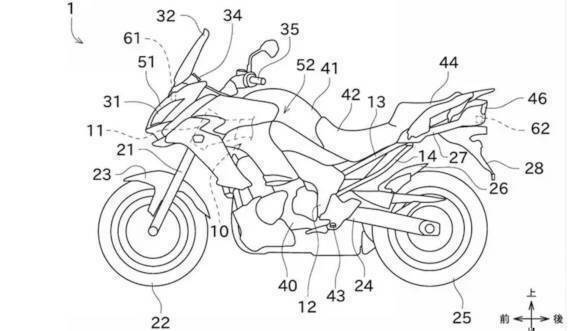 And now patent drawings of Kawasaki's plans to use radar-assisted safety systems on its upcoming motorcycle have surfaced online. The motorcycle in the drawing is an adventure tourer similar to a Versys 1000 but it could be its smaller offering, the Versys X-300 as well. 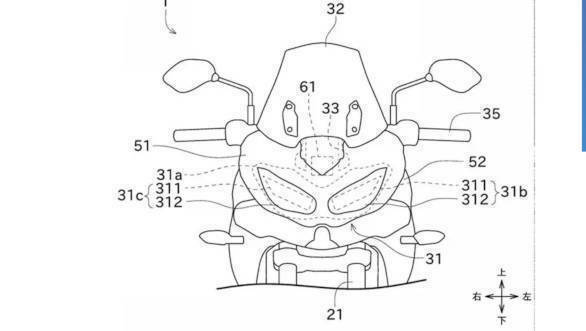 As seen in the drawing, Kawasaki will be equipping its machines with front and rear radar. As in the case with cars, the front radar will help measure the distance between the vehicle in the front and itself, and make use of ABS and electronic throttle to control its speed with the help of adaptive cruise control. This system will also engage automatic braking to avoid any unfortunate incident or accident. On the other hand, the rear radar, which is normally not seen on cars, keeps measuring the distance with the following vehicle. Although this system will not apply brakes, it will alert the rider in case the following vehicle is approaching too fast. This should give the rider the time to respond accordingly and change paths if required, to avoid collision. This system will also be seen on KTM and Ducati machines. German brand Bosch, known for its innovations and developments in the field of ABS and stability control, will be one of the major suppliers of the above mentioned radar tech. The company does offer its services and applications to almost every major automobile manufacturer. Since Kawasaki is one of the key consumers for Bosch, it is said that the radar-based tech that will be used in Kawasaki motorcycles in future, could be developed and supplied by Bosch. Referring to the drawings, the radar units are likely to be positioned above the headlight and underneath the tail light. Last year, Harley-Davidson had reportedly filed for a patent application for an automatic emergency braking system. The system that uses sensors to gauge when a collision is about to take place and applies brakes automatically. The automatic braking system relies on radar, cameras and other sensors to constantly monitor the surrounding environment. And when the onboard computer estimates from this data that a crash is about to take place, it engages the brakes.